The Princeton Nassoons is one of the world's finest collegiate performance ensembles. Founded in 1941, we have sung our signature four-, five-, and six-part harmonies alongside the likes of Ella Fitzgerald, the Lettermen, and Ben Folds. We tour the globe three times a year, sharing our music, dancing, and jokes with audiences that have included three U.S. presidents, royalty, vacationers in Cancun, screaming school children in Hong Kong, and socialites in Monte Carlo. The group is currently made up of 14 undergraduates at Princeton, and we hope this site will allow you to get to know us a little better. As always, we can be reached at nassoons@princeton.edu. Formed as a close-harmony a cappella alternative to the University Glee Club in the late 1930's, their early days were spent practicing in the basement of Princeton's Murray-Dodge Hall. The yet-unnamed group mainly rehearsed for and performed small on-campus shows. However, the turning point came on a cool autumn New Haven evening in 1941. Seven men, as the story goes, stood before the sold-out Princeton-Yale Weekend Glee Club Concert audience. Having obtained permission from the Glee Club director, they launched into a short set in the middle of the Princeton program. The dishearteningly lukewarm reaction of the audience began to take its toll on the ensemble who, in desperation, pulled out an arrangement which the Glee Club director had explicitly prohibited them from using. Its racy lyrics and bawdy five-part harmonies, he feared, would offend the tender sensibilities of the stodgy New Haven audience. That song was Perfidia, and as the last robust chords echoed throughout the hall the audience rose to its feet in a chorus of applause, demanding an encore. The seven Princetonians had no choice but to launch into Perfidia for a second time - and the Nassoons were born. The album cover from the Nassoons 1955 anniversary album. Still, 75 years later, every member of the Nassoons learns exactly the same arrangement of Perfidia that the founders sang in their first ever performance in 1941. 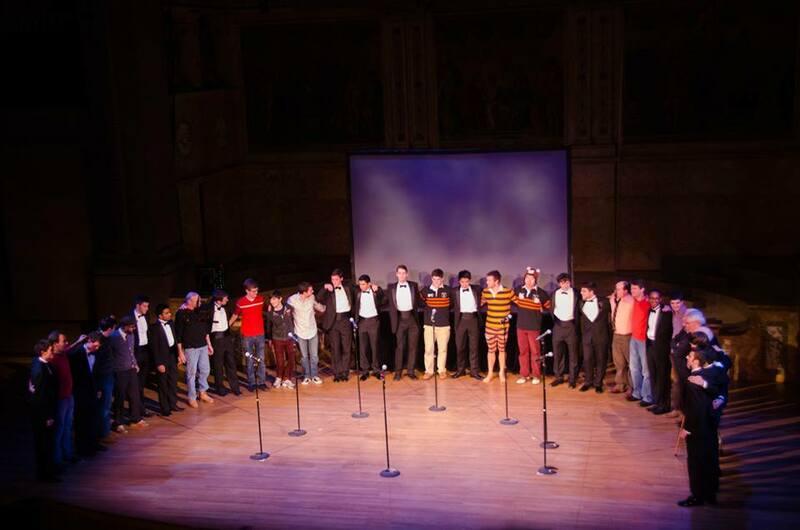 Here's a picture of current members and alumni singing it together at the end of Yale Jam 2014. Before they received the Nassoon Room, the Nassoons rehearsed in the basement of the Presbyterian Church on Nassau Street. When 1901 Hall was built in 1949, however, room 100 was deeded specifically to the Nassoons, and the group has sung there ever since. The Nassoons also hold the deed to Blair Arch. 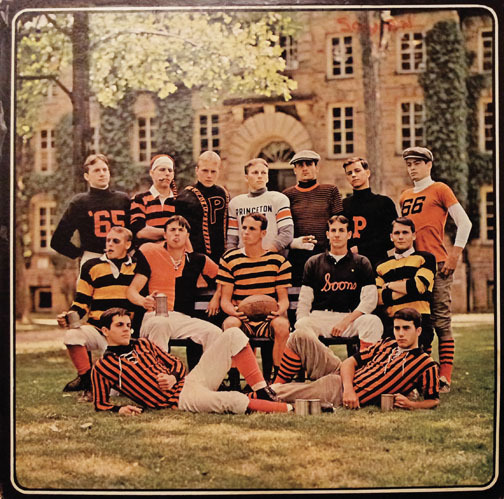 Every year, the day after the Princeton-Yale football game, the Nassoons and the Yale Whiffenpoofs face off in touch football. The winner takes home the coveted TF trophy. The Nassoons have won the past three match-ups by a total of 29 touchdowns. Nassoon group photos are called OJTs after Orren Jack Turner, the man who took the photos for almost 50 years. You can easily find the president in any OJT from 1959 on - he is the one wearing two watches (for punctuality) and with his hand on the President's Cup. The Nassoons disbanded just a year after their founding, as most members left to fight in World War II. The group was reformed three years later. The Katzenjammers, Princeton's first co-ed a cappella group, and the first co-ed group in the nation, was founded by a Nassoon and a Tigerlily. Every piece of furniture in the Nassoon's room has a story; for example, the chair for our Business Manager is engraved with the initials of every past BM. SFC, the Nassoons' motto and symbol of brotherhood, was adopted in the 1950s. Nassoons tell no one what it means - not even their spouses. In short, no one who is not a Nassoon knows the true meaning of SFC.